Folded color map in Spanish. Includes main region map (scale 1:200,000), Manzanilla (1:38,790), Armeria (1:13,490), and Minatitlan (1:14,200). 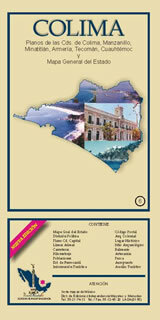 Also includes insets of Comala, Tecoman, and Cuauhtemoc, as well as a brief history of the area.